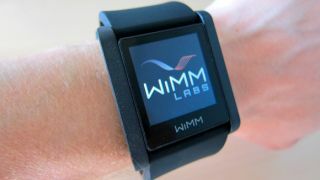 Sony and Samsung aren't the only ones looking to slap an Android-based smartwatch on your wrist in the future, as Google acknowledged today that it acquired smartwatch maker WIMM Labs. "I can confirm that Google has acquired WIMM Labs," a Google spokesperson told TechRadar. The buyout of the Los Altos, Calif.-based company happened last summer, according to WIMM's now defunct website. "During the summer of 2012, WIMM Labs entered into an exclusive, confidential relationship for our technology and ceased sales of the Developer Preview Kit." That company turned out to be Google, we learned today from a report by GigaOM. It's safe to say that the start-up company's WIMM One smartwatch that launched seven months before the acquisition caught the attention of the search engine giant. After all, the wearable computing device was based on a modified version of Google's Android operating system and uniquely featured what WIMM called "micro apps." These micro apps are still available for existing WIMM One owners who have hung onto their smartwatch (or who have the smartwatch still hanging onto them). The apps ranged from a compass to a simple RSS reader. Like every platform, a Facebook app was made available for the developer-focused smartwatch, albeit at a microlevel. Google wouldn't confirm any more details outside of the WIMM Labs acquisition, but the team has supposedly been integrated into Google's Android team, according to the GigaOM report. That makes sense given its experience with the platform and rumors that Google is looking to launch an Android smartwatch of its own. Sony recently announced the Sony Smartwatch 2 due out on Sept. 9 and Samsung is expected to unveil its Samsung Galaxy Gear smartwatch on Sept. 4. Google, meanwhile, may wind up having Motorola handle the creation of its Android smartwatch. The Google-owned company posted a job listing requiring wearable technology experience that alluded to a forthcoming smartwatch. It could also pair with Google Glass according to a recent patent, giving it an edge over its rumored Apple iWatch competition. Where WIMM falls into the inner workings of Google's smartwatch plans remains unclear.